Discotizer´s House Music Blog: Lottery for new Live Radio Show "Our House Is Disco"
Lottery for new Live Radio Show "Our House Is Disco"
For the start of our new radio show "Our House Is Disco" i'm doing with my DJ in crime Pascal Koppetsch aka DJ PaKo, i'm giving away a Sony Walkman MP3- / MP4-Player 8GB with all my mixes (nearly 70) on it. Our live show will feature mostly Disco-House (Classics and new ones) and related music provided with a lot of background info on the songs or artists. We will have special guest DJs from time to time. Most of the time we will speak in German (trying to keep it short) but we hope you don't bother if you don't understand us. Coz it's all about the music! 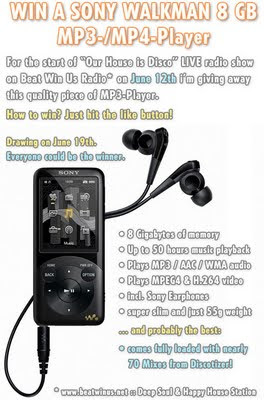 The show will air on Beat Win Us Radio on sundays in a 2 week rhythm from 7 pm to 9pm (Paris time) starting on June 12th - check the eventpage on Facebook for more info. After airing you will be able to download the show. 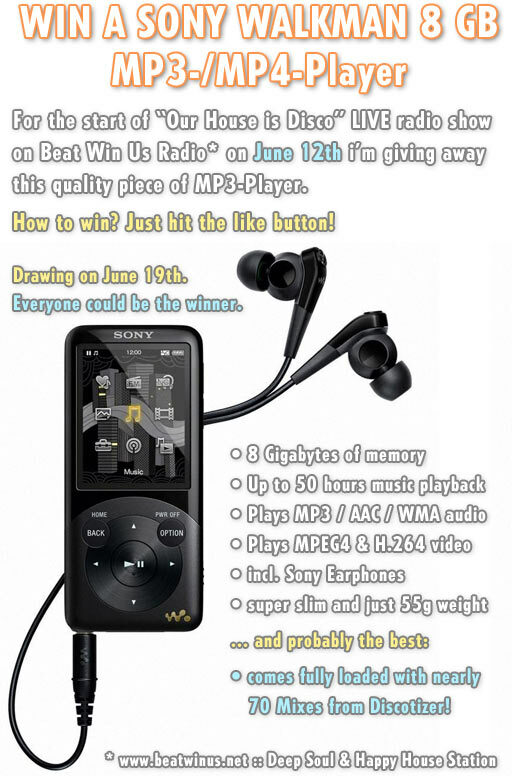 All you have to do to win this quality MP3 player is hitting the like button on my fanpage. Lottery ends on June 19th.